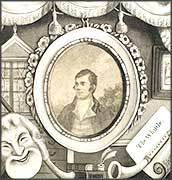 Robert Burns spent the final years of his life in Dumfriesshire. During these years, he read the complete works of Shakespeare. His own only completed dramatic work is 'The jolly beggars'. 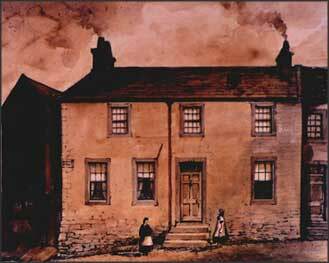 From 1788 Burns attempted to farm at Ellisland, but the ground was so exhausted that this ultimately proved fruitless. 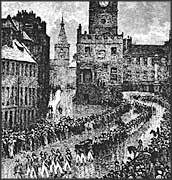 In September 1789 he began work for the Excise at Dumfries. Though he performed these duties diligently and compassionately, charges of political disloyalty were raised against him. While in Dumfries, Burns enjoyed a friendship with Robert Riddell of Glenriddell, to whom he gifted a manuscript volume of his selected poetry in 1791. A second volume of Burns's prose had yet to be completed when Riddell withdrew his friendship after an incident, still unexplained, which took place in Riddell's home at Friar's Carse. The first volume of the Glenriddell Manuscripts, as they came to be known, was returned to Burns at his request in 1794. During this period, failing health — which Burns sought to remedy by sea-bathing — overshadowed his literary and musical output. Years of hard physical labour working on a series of unproductive farms aggravated his long-standing heart condition. This lead to his premature death at the age of 37 on 21 July 1796. On the day of the poet's funeral, his wife gave birth to their youngest son, Maxwell. By permission of the National Museum of Scotland. Title page from the Glenriddell Manuscripts, compiled between 1791 and 1793. 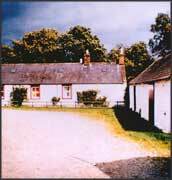 Robert Burns's house in Dumfries. Do, for Heaven's sake, send Mrs Armour here immediately. My wife is hourly expecting to be put to bed. Good God! what a situation for her to be in, poor girl, without a friend! I returned from sea-bathing quarters today, and my medical friends would almost persuade me that I am better, but I think and feel that my strength is so gone that the disorder will prove fatal to me. — Letter to James Armour, father-in-law, 18 July 1796.